Lovely spacious one-bedroom apartments in an area with excellent infrastructure. 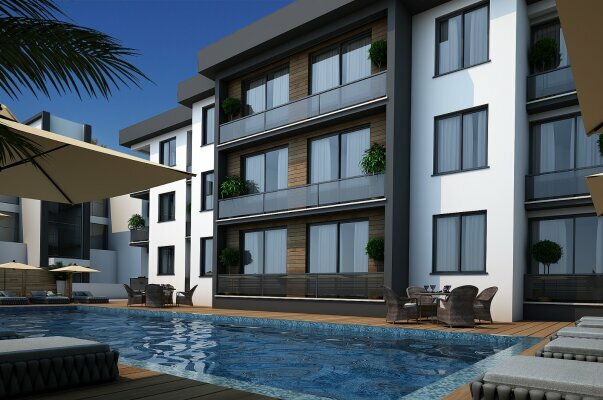 The apartments are located in a neat complex with a large communal pool, children's playground, a spacious parking area, a market, a 24-hour video surveillance system. Everything you need will be at a walking distance - shops, bazaars with fresh vegetables and fruits, restaurants and cafes, fitness center, beauty salons. Just 5 minutes to the most popular sandy beaches and 20 minutes to the center of Kyrenia. There is an interest-free installment plan until the end of construction.